Aikawa/Hanbara area after dusting of snow. Sunday I rode my first brevet of 2016, a 200 kilometer trip from Inagi-shi to Atami and back sponsored by the Aoba (Yokohama) Velo Randonneurs group. Aoba rides often start along the Tamagawa, within 10-15 kms of my home. This one was a bit farther away, 17-18 kms, with start and finish at Omaru Park just at the base of the "hospital hill", making the day's ride 235-240kms total. The Aoba volunteer "staff" for this ride included Tominaga-san and Minoda-san, two of the most intense commuting and randonneuring cyclists in this part of Tokyo. Tominaga-san, whose 50+km daily roundtrip commute takes him down Komazawa Dori, and Minoda-san, who I sometimes see if I happen to be riding along the Tamagawa during commuting hours -- heading downriver on the Kawasaki side in the morning, back up on the Tokyo side in the evening. Both much faster than me. Both signed up for the Saitama Audax 2400km "Japan end-to-end" ride scheduled for Golden Week. There were lots of friends and acquaintances among the riders on this event as well. Aoba seems to attract a lot of regular, seasoned participants. Lots of Audax Saitama PBP jerseys and 2015 Audax Japan vests produced for PBP (I wore mine). Aoba staff at the finish ... still light after 5PM now! I left home a few minutes before 5AM, arrived at the Start just as the briefing was about to begin, and due to a quick restroom detour ended up near the back of the slower of "bike check" line and one of the last out on the road. The first 30 kms traffic lights were a problem -- I was stopped at more than the usual number of lights heading out Onekan, and seemed to hit just about all of them going through Machida/Sagamihara area over to Aikawa. The other problem was ice. Just a few minutes after the start, crossing a bridge OVER Onekan, there was already an accident, a cyclist who has fallen, police van on site already with lights flashing, awaiting ambulance. He apparently broke some bones (collarbone? arm?) but will recover. We were ice-free until the area around Hanbara and Miyagase-ko, where again the road became a bit treacherous at points. Yoshida-san (who I recently discovered is an executive at the Japanese subsidiary of a Netherlands-based company that acts as secretariat for a Tohoku rebuilding charity effort I have been involved with since 2011, and whose office I have been visiting regularly for the past 4 years) slipped on a patch of ice as we approached Miyagase, but at least did not break any bones and completed the ride. He said this was his third brevet of 2017, already! I made it through the icy patches without a problem. I was riding the Renovo -- a rideable work of art -- with 700x28 Conti tires inflated to around 70 psi (4.8 bars) and so had much, much better grip on the roads than most of the cyclists I saw with their 700x23 or 700x25 tires at 90-110 psi (6.0-7.5 bars). The Renovo was a joy to ride as always. The combination of its wood frame and slightly larger tires really does seem to dampen the bumps and road chatter, so I feel less tired and jarred -- a noticeable difference on the last stretches of a long ride like this. My clothes also worked perfectly, in weather ranging between 0 and 8~9 degrees Celsius. I wore my Q36.5 "hybrid Q" tights and jersey/jacket. While lighter weight than most winter gear, I find it perfect in this temperature range, with a long-sleeve inner layer and, during morning and evening hours, a light goretex rain shell. The key for me is to keep head, hands and feet warm, then get by with as thin, light and breathable gear as possible over my trunk and legs, to reduce condensation and stay warm not only when I ride but when I stop to rest. It worked perfectly on Sunday. The highlights of the trip for me were (1) Miyagase-ko after a light overnight snowfall -- the photos tell the story, and (2) taking Route 740, the "old road", between Manazuru and Odawara. Route 740 was a revelation for me, a way to get off of the horribly congested coastal Route 135 for about 10 kms of the trip between Odawara and Atami. Of course, I assumed that if it is an "old road" and goes high through the hills of Izu, it must be impossibly hilly, right? Actually, none of Route 740 was steep, and I think the total climbing was no more nor less than on the coastal route with its ups and downs. 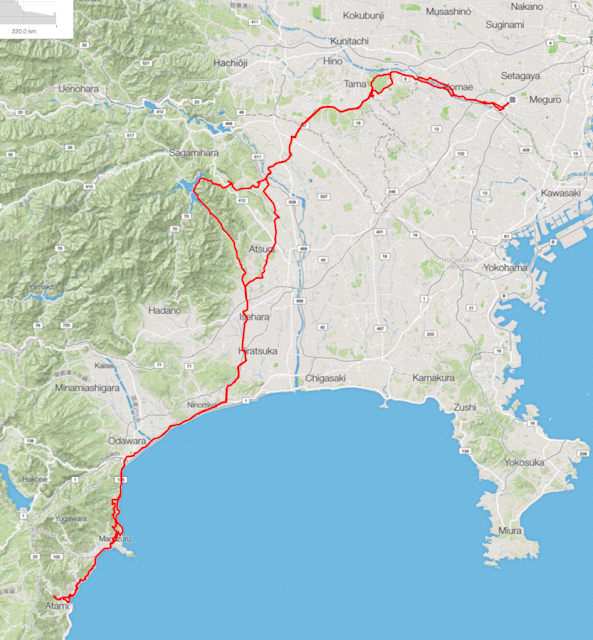 With this road, I will consider cycling to Atami (or Manazuru/Yugawara) in a whole new light. The event's route planner (the aforementioned Minoda-san) seemed to want to avoid a "flat winter brevet" and wanted us to go up and down some hills for training. So the route included around 2200 meters of real elevation gain. Most of this was to good purpose and took us through nice territory. But after we arrived at Atami and took a circuit of the harbor area, there was one last nasty, steep climb up through the town and it seemed like half the way to Atami Pass (actually just under 200 meters of elevation gain), to the turn-around convenience store. This was pure punishment, climbing on a narrow shoulder past a line of cars at over a 10% grade ... with little to no view for reward. Still, it did manage to make the 200 km event seem, well, not so easy. Entrance to the Atami "plum garden" -- trees blossoming already in early February! I made it back to the goal in just under 11 hours. Not a fast time by any means but a very nice ride on a course that had its challenges. Team Metabolic Racing (as in Japanese "metabo" or "metabolic syndrome"--Perhaps I could join? Nice pictures! I like the one "Aikawa/Hanbara area after dusting of snow. ", so cool!, and probably so cold, it was.. Thank you for choosing our brevet as your first one this year. We hope you enjoyed the course, and coming again for next - we have some "super" series this year which includes more "elevation" than our usual course, and they might be your favorite ones! Thanks, Tominaga-san. My only plans for this year are to try and squeeze in Okayama and Hokkaido 1200s, and the Fleche that ends in Kumamoto. No 300, 400 or 600s yet on my calendar, so I hope I can ride one of your "super" events. The 7/23 "super 400" over Jukkoku, Mugikusa, and Yanagisawa looks like quite a challenge ... though not consistent with Hokkaido. Cruzbike -- A better recumbent bicycle design?